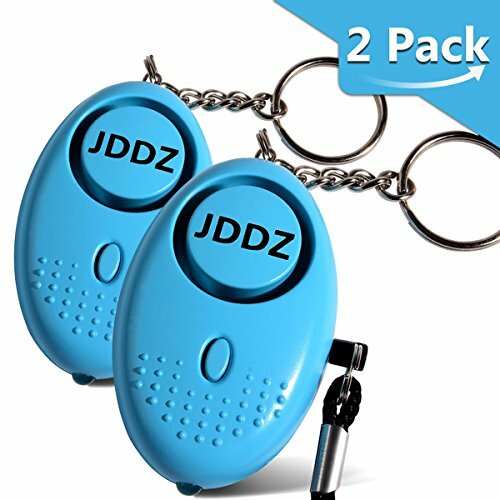 ❤ 2 IN 1 FUNCTION ❤ As a anti-spy hidden camera detector, it detect radio wave , magnetic field, hidden wired or wireless camera equipment and it can effectively prevent candid photos and personal privacy leaks. As a safesound personal security alarm, it can reach130 db Loud sound, the 130 decibel can effectively scare attackers in danger and seek people around for help, Very good helper when you travel or you are alone. 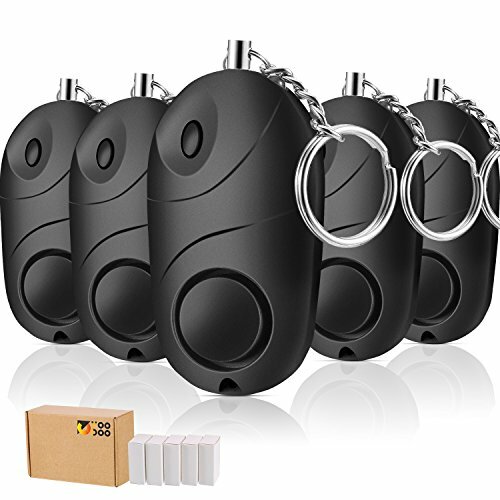 ❤ WIDELY USED ❤ The bug detector & camera finder set can can use for home, office, hotel, car, bathroom, changing room, business negotiation, confidential session, factories, important workshop and research room, military installation, government agencies, entertainment venues. 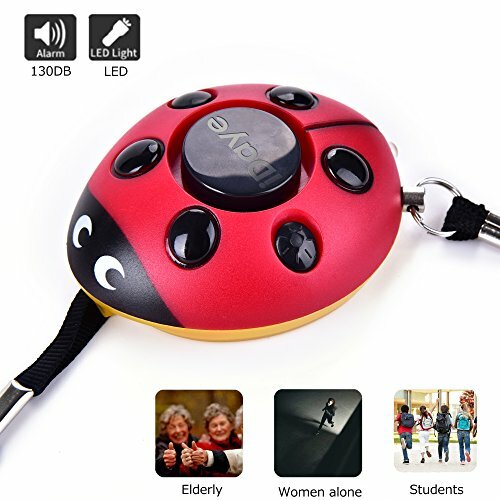 The safety alarm is designed with LED lights for night lighting, suitable for students, elderly, children, women, night workers and so on; Very useful for traveling, hiking, camping! 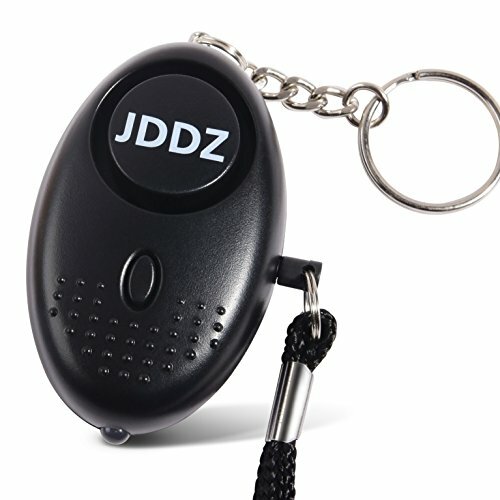 ❤ 3D COMPREHENSIVE SENSOR CHIP & PROTECTING PERSONAL AND PROPERTY SAFETY ❤ Professional radio detection device, stronger anti-jamming, wider range of detection frequency. 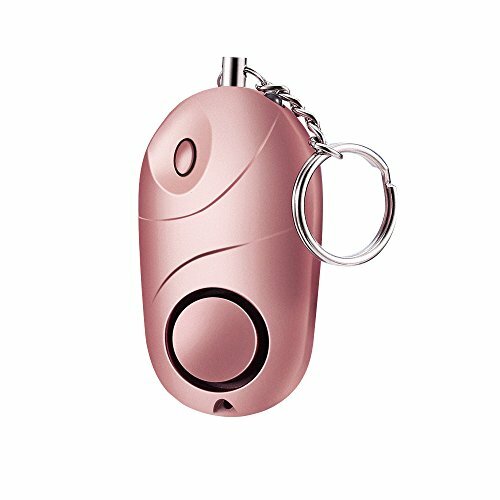 Once your start you open the Vibration Function, it's can protect personal and property safety, it's will alarm you if there is anything is not right. 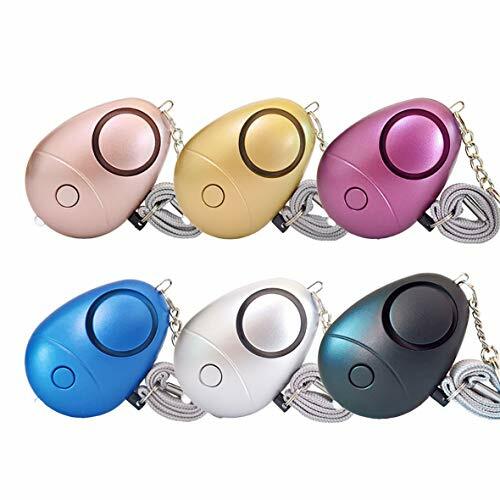 you can use in the suitcase, glass door, locker, strongbox, security door. The K98 designed for traveler! 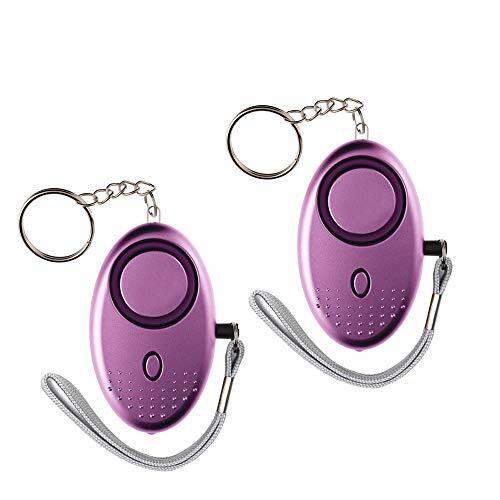 ❤ COMPACT & CONVENIENT ❤ the safety alarm keychain is small and portable for easy storage and carrying; It can be attached on women's bags, backpacks, school bags, belt loops, suitcases, keys and so on; And you can take it even when you are on the plane. 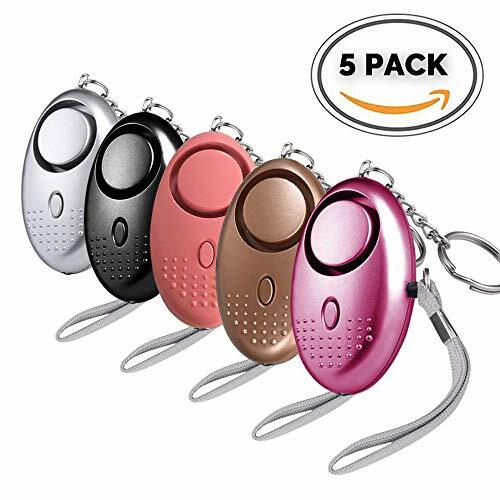 ❤ PERFECT GIFT IDEA ❤ Wonderful present for business man and woman, college, girlfriend, students, children, women, teen girls, night time workers' self-defense, dangerous adventurers and travelers. 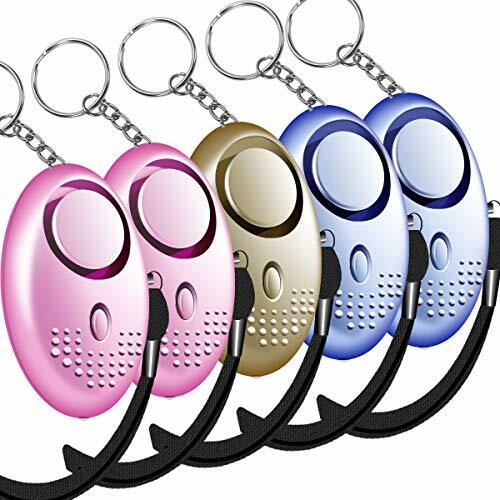 Personal alarms guarantee: Keychain Alarm equips included LR44 batteries for extended life! Lower power consumption guarantees long time uses. 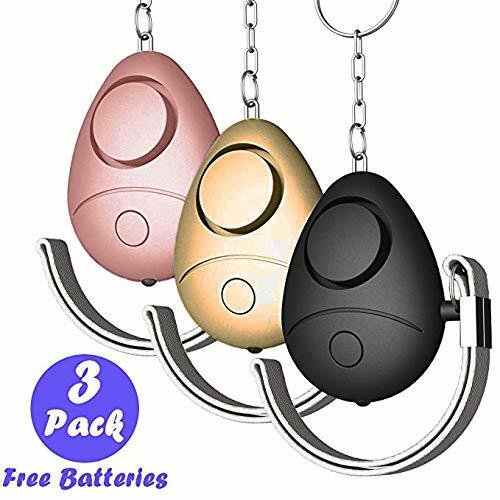 If not in use, the batteries have a 365 day standby time, with 1-Year Manufacturer's Warranty and 30 days no-questions-asked return policy. 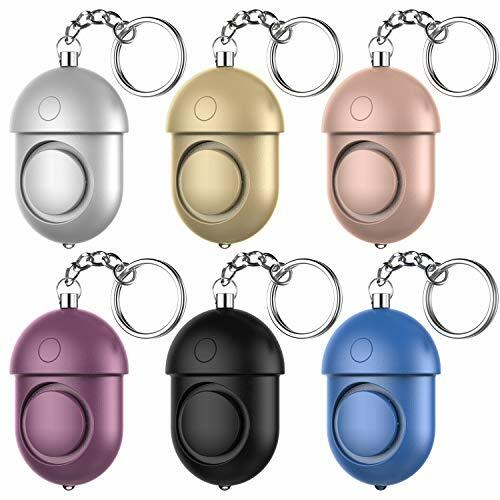 Bear Gentleman lucky cat is not only a mini lucky cat SOS personal machine,but also a lovely pendant.You can hang it on your keys,bags,school bag,women's handbag,People in danger for self safety protection. 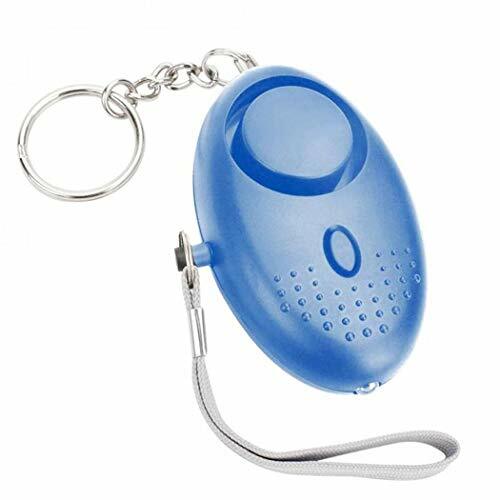 Loud:When you are in danger,just pressing the button( or pulling the pin)to make up to 130db loud sound.Can effectively scare attackers in danger and seek people around for help. 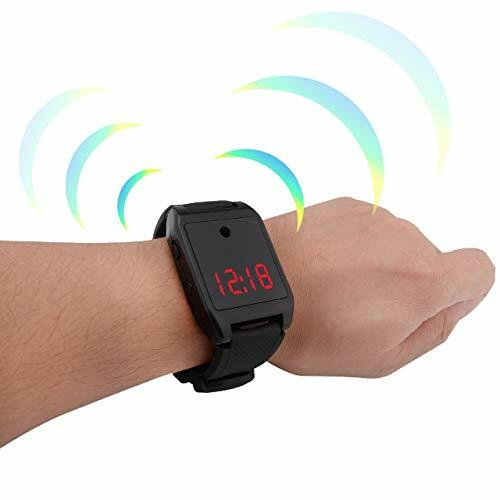 Long Life:High quality production and easy to replace battery,ensures product quality and longevity.The product also comes with LED lights,which can also give you a light when needed. 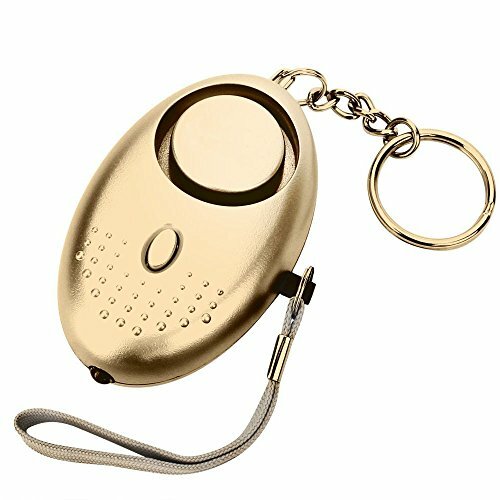 Wonderful Gifts:Suitable for people at all ages,students,elderly,children,women, night workers,night running and so on.Is the first choice for gifts. Exclusive APP:Bear Gentleman exclusive APP,A standalone apps that only need to download and install according to the instruction in the package.When in danger or emergency,can use the APP send your position to your family or friends(Meanwhile support 5 people) . 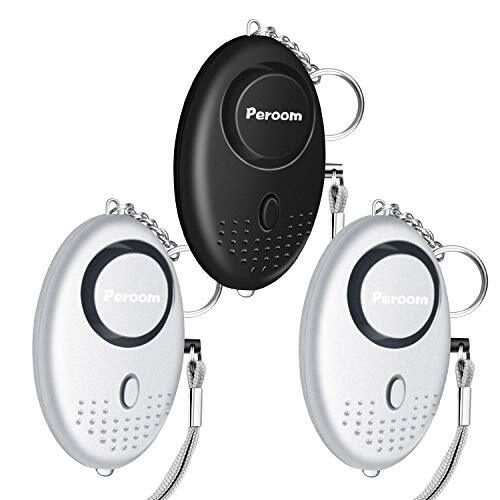 Portable: designed with keychain and lanyard, convenient for you to store or carry the personal security alarm; You can attach it on bags, backpacks, school bags, belt loops, suitcases, keys, etc. 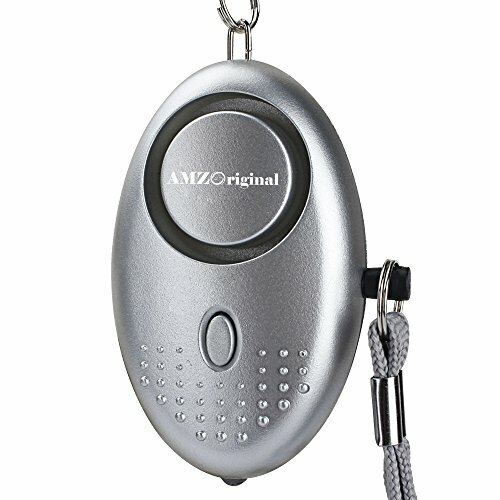 Powerful Performance：Sound up to 125-130DB strident panic alarm，enough to draw attention or deter the attackers. 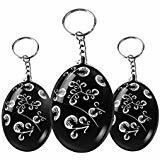 Exquisite design：Oval shape design,Mini Portable,disguised as a bag decoration， attached to your keychain, schoolbag, backpack. Suitable range: the LED lights of the personal safety alarm allow for night lighting, which is useful for traveling, hiking, camping and dog walking at night; And the alarm fits for people at all ages such as students, elderly, children, women, night workers, etc. 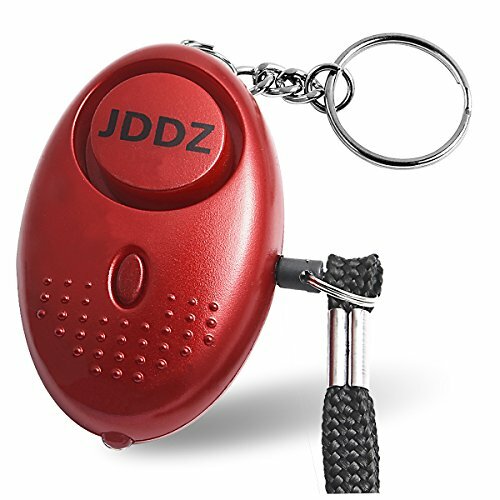 ★130db LOUD ALARM ★ - 130db extremely loud alarm/siren, immediately draw attention even at distances as far as 600 ft, effectively scare attackers in danger and seek for help from around people. 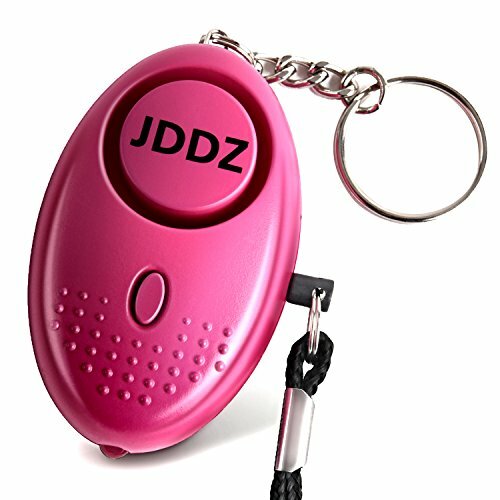 ★ EASY TO ACTIVATE ★ - Pull the pin out to activate the alarm and insert it back to stop it, alert anyone up to 600 feet (185 m) away, a good helper when in emergency or need help. Batteries included(4*LR44). 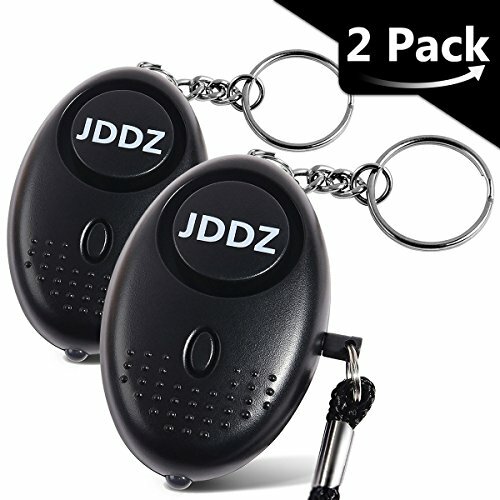 ★ ORDER NOW WITH NO RISK! 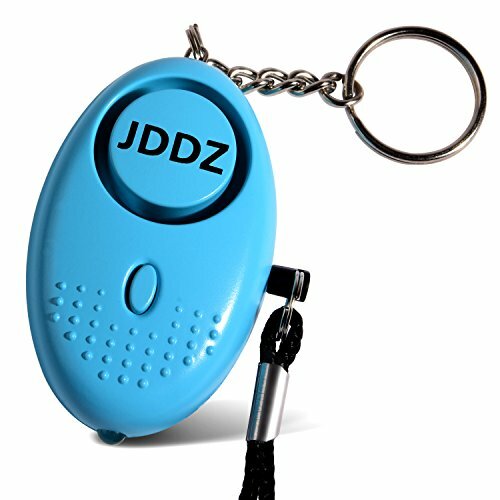 ★ - Every keychain alarm purchase comes with a ONE-YEAR HASSLE-FREE WARRANTY and friendly customer service provided by JIAMM. 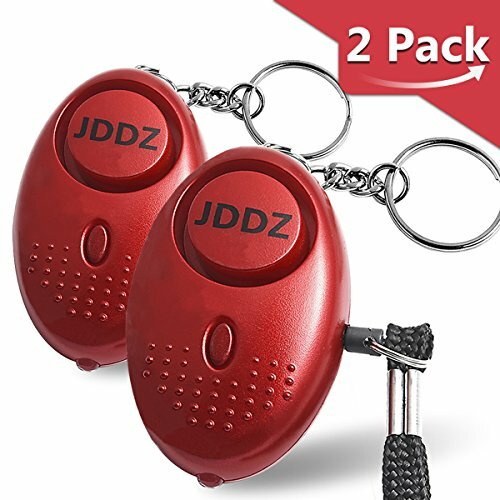 ✔120 dB LOUD SOUND：The emergency personal alarm can make a loud sound to draw people's attention even at distances as far as 600 ft; The 120 decibel can effectively scare attackers in danger and seek people around for help; It will be your good helper when you have troubles or need help. 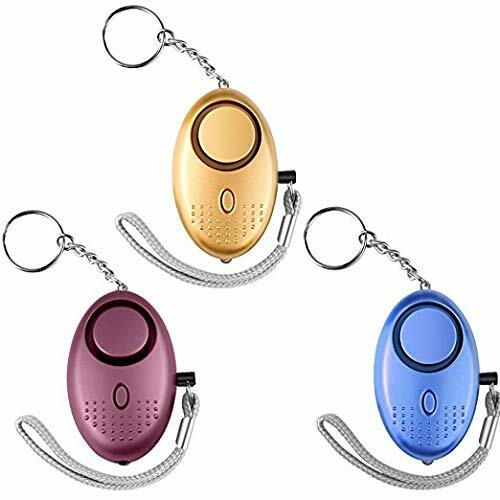 ✔DURABLE QUALITY：This personal alarms have shell with high-quality environmentally friendly material,resistance to fall,crush and voltage,and high temperature,and the copper plug,not rusty,beautiful and durable,won't break in your most adverse conditions. 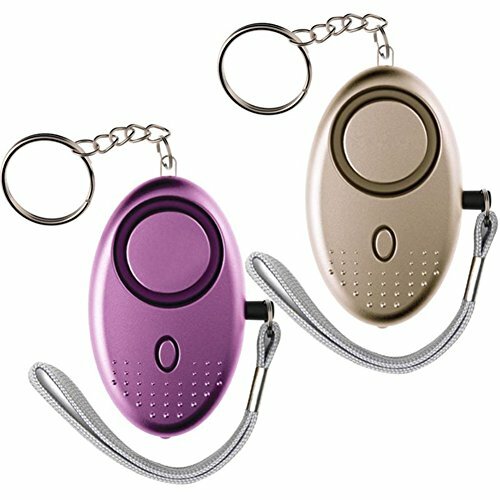 ✔COMPACT AND CONVENIENT: The safety alarm keychain are portable for easy storage and carrying; It can be attached on women's bags, backpacks, school bags, belt loops, suitcases, keys, dog belts and so on; And you can take it even when you are on the plane. 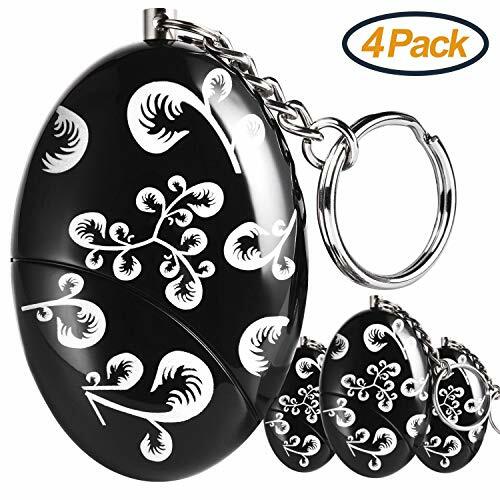 ✔Wonderful gifts: The package comes with 4 pieces self-defense alarms, beautiful pattern make this alarm an unique bag decoration while; These delicate alarms are exquisite gifts sent for your friends, loved ones, seniors or even children. ✔GUARANTEE: We offer a 100% money back guarantee if you are not satisfied, without any questions asked. 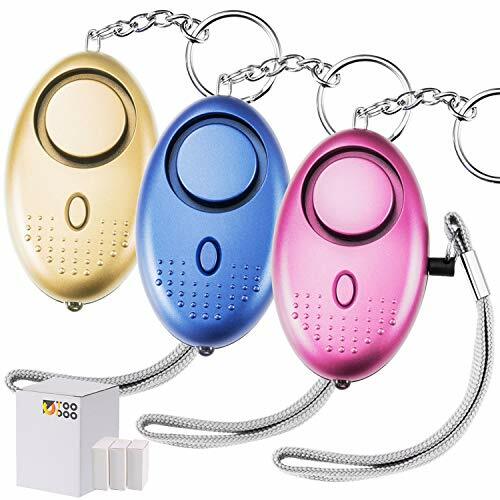 ❤【PORTABLE SIZE】 - The hidden camera detector weighs only 1.12 ounces, the length of the spy camera detector is 3.5 in and the thickness is 1.1 in, lightweight, handheld and compact, easy and convenient for traveling, carrying and storage in handbags, purses, pockets and suitcases. 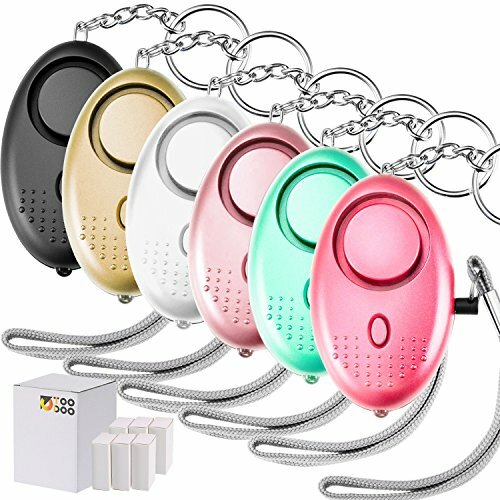 The safesound personal alarm can find pinhole cameras, protect your privacy and keep personal security anytime and anywhere. 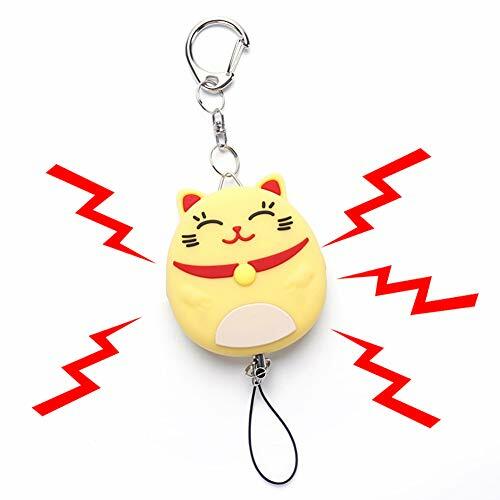 ❤【EASY OPERATION】 - It takes 1-2 hours for the personal alarm to be fully charged with a USB charging cable and can be constantly used for 8-10 hours. 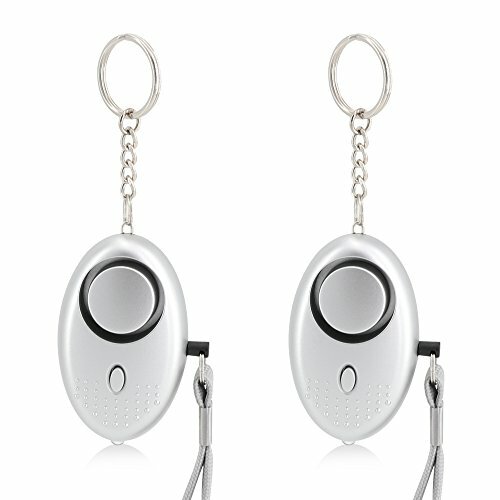 3 functions (anti-spy detector / safesound personal alarm / mini LED flashlight) can be freely altered through certain buttons. 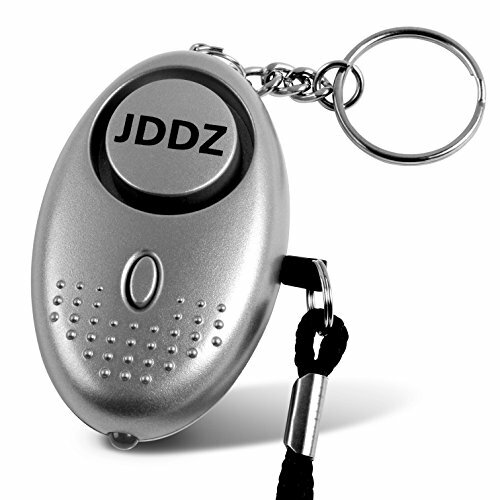 The anti-spy detector features easy operation and a long service life. 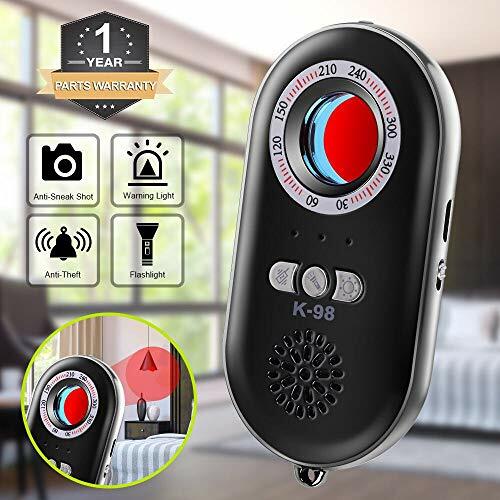 ❤【ANTI-SPY DETECTOR】 - Hidden cameras such as lighter camera, pinhole camera, watch camera or pen camera can be easily and quickly detected by the infrared of the safe personal alarm, effectvely protecting individual privacy when you are in a hotel or any other places. 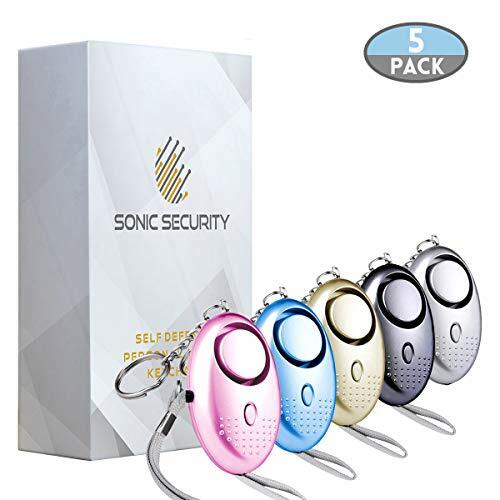 ❤【SAFESOUND PERSONAL ALARM】 - The defense alert can be secured on draws, security windows, doors and box, making a loud sound to draw people's attention even at very far distances. 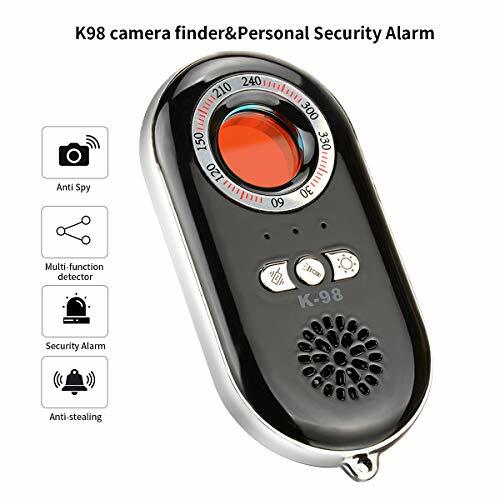 The hidden camera finder can effectively scare dangerous attackers away and help you ask for help, ensuring personal and property security. 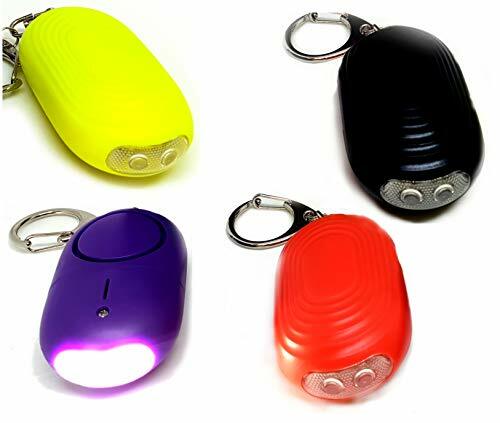 ❤【MINI LED FLASHLIGHT】 - The defense alarm can be also used as mini LED lights, featuring sharp lighting effect, long lighting distance and wide lighting range, suitable for nights and terrible environment. 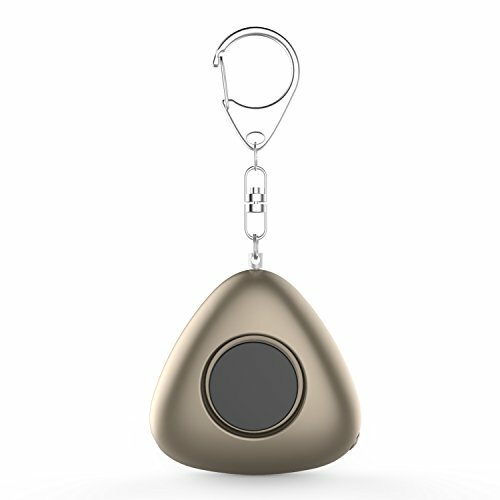 LOUD SOUND: Personal alarm from device to sound up to 130db alarm, people can draw attention even in a far distance(330 ft away). 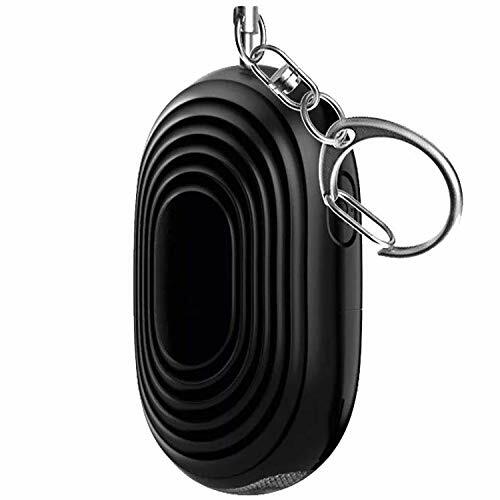 The siren will sound continuously for 90 minutes unless the pin is reinserted to the device. MULTI-FUNCTION: Personal Alarm Keychain is designed with LED lights for night lighting, suitable for people at all ages such as students, elderly, children, women, night workers and so on; It is a useful self-defense accessory for traveling, hiking, camping and dog walking at night. 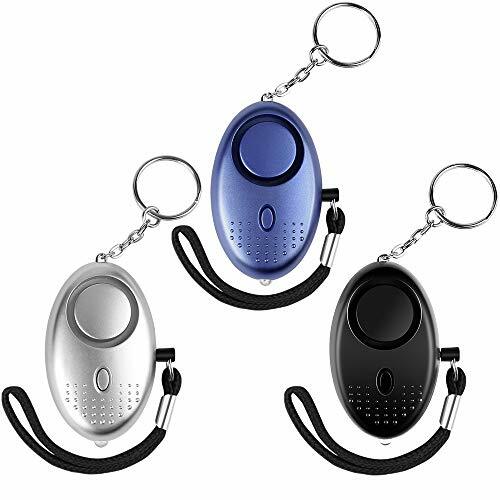 COMPACT AND CONVENIENT: The self-defense keychain is small and portable, can be attached on a backpack, school bags, belt loops, suitcases, keys, and so on. Looks smart and fashionable. 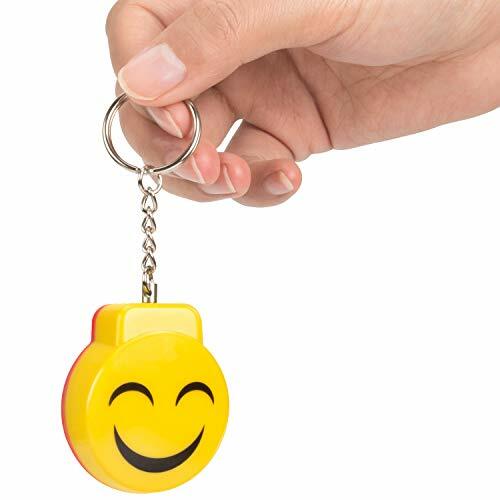 Keychain design is perfect for use with house keys or car keys. 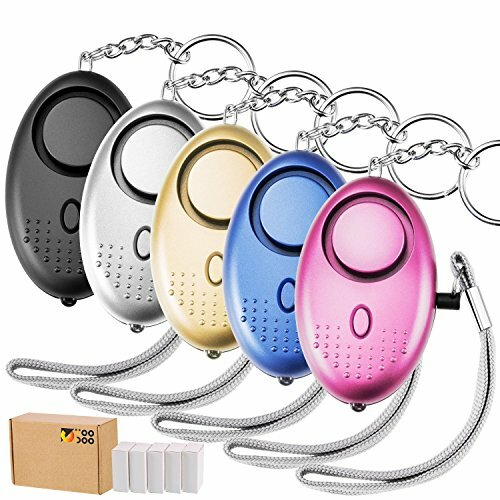 BEST GIFT: This safe personal alarm makes a fantastic present for any occasion or type of person such as a teenager starting college, Christmas gifts, Black Friday, and Housewarming Parties. 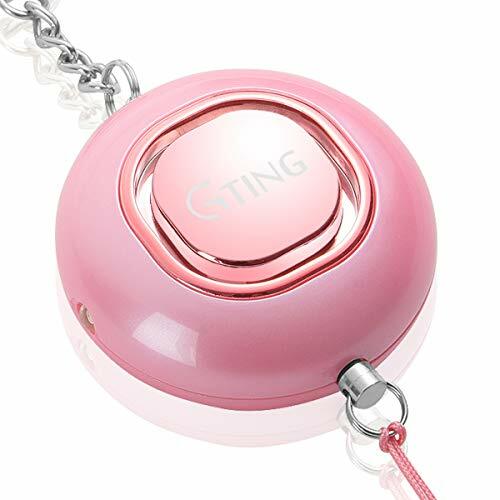 QUALITY GUARANTEE: If there any questions or are not satisfied with our personal alarms for women, please contact us, we will do our best to give you the most satisfactory solution. Super loud 135dB strident panic alarm and disguised as a bag decoration. 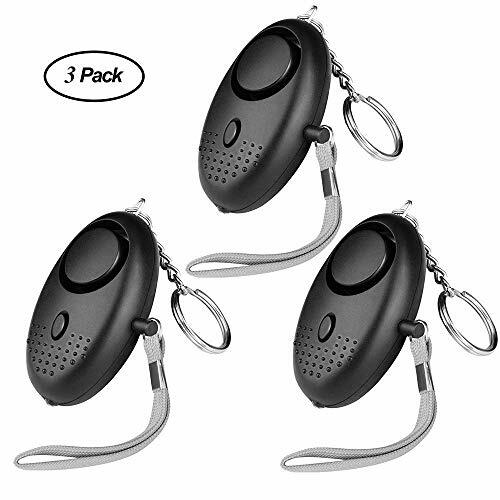 Four LR44 batteries included in package and replaceable for practical usage. 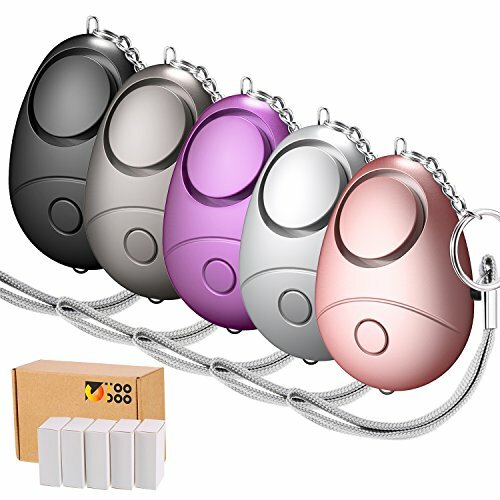 High quality products and 30 day money back guarantee for your satisfaction.